Back in my corporate travel days, when I would regularly find myself jetting off to exotic lands like Cincinnati and Indianapolis and Rochester, New York (the Flower City! ), I had to make it a rule to never leave a place without trying something local, whether that was a microbrew or a type of chili or a local delicacy known as a “garbage plate” (yeah, I’m looking at you again, “Flower City”). Some trips made that easier than others. My rule was inspired by a three-day meeting in Nashville when I realized I never actually visited Nashville. Even a local beer at the hotel bar would have helped me nurse my no-time-for-BBQ wounds. That’s why hotel restaurants like the newly renovated Market Kitchen & Bar inside the Hilton Wilmington/Christiana can be a godsend to the weary traveller. One glance and you know what’s local – because it’s printed with pride, ingredient by ingredient, in bold Delawarean blue right there on the menu. 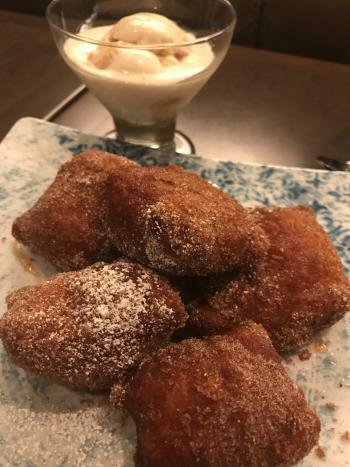 Locally sourced products, from Kennett mushrooms to Milton beer to Hockessin ice cream, run through each course on the menu. We started with cocktails on a recent visit. 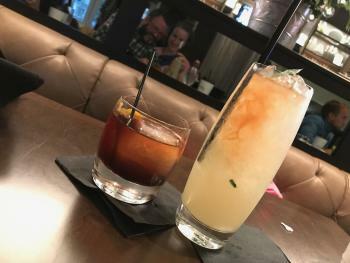 I had the Delaware Old Fashioned, made with the Diamond State Bourbon that’s made by Mike and Ron down at Painted Stave Distilling in Smyrna, while my wife had the Queens Park Swizzle with Dogfish Head Light Rum. (Dogfish might be better known for its brews where you’re from, but here in Delaware, we know their distilling operation is first rate.) The Old Fashioned was a serious drink with a seriously large ice cube, showing respect for the spirits inside. I only had one, but if I had another, I would have ordered something with Stateside Vodka, a new spirit out of Philly that’s blended with electrolytes and therefore good for you, clearly. Once you start on the noshes, you should make plans to nibble around the menu. The casual atmosphere of the restaurant lends itself to ordering one thing, sharing it around, and then ordering something else. 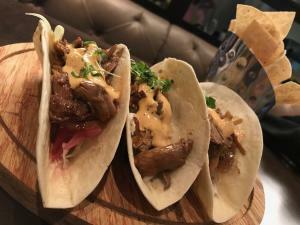 We plucked the root beer BBQ duck tacos from the sandwich list and declared it to be an appetizer, and one taco (of the three that come to an order) with pickled onions, cucumbers, cabbage and a chipotle aioli certainly whet the appetite for more to come. Many items on the entrée list speak to the region, like crab cakes with avocado citrus aioli and roasted chicken breast with mushroom risotto, but it’s the burger that arrives with serious wow factor. This “Cow Tipping Burger” is made with beef from Reid Angus Farm and stands tall with caramelized rosemary onions, house-made pepper bacon, an herb spread and local cow tipper cheese from Calkins Creamery that melts into a saucy, satisfying mess. 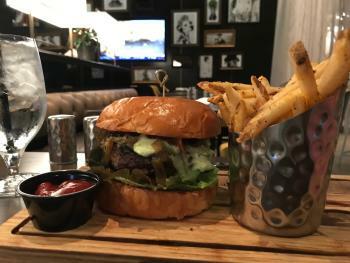 People who suffer from order envy, be warned – I got just one bite of my wife’s burger, and that’s just because it was my job to have a bite (and she bought that story). No one should leave Delaware without having some Woodside ice cream, and you’ll find it here in salted caramel form next to the freshly fried beignets, with sugar and local honey (which I hear is good for allergies, so make sure to eat these beignets in spring and in fall and whenever you’re planning to be outside for more than 90 seconds, because beignets). I’d expect the menu to change as the chefs and staff discover new partners in the region, but right now, Market Kitchen & Bar offers a great intro to what our local food scene is about, both for business travellers who can only escape for one meal, and for weekend explorers, looking to add some culinary stops to their trip list. The HOTEL DUPONT earns its four AAA stars with every meal in the famed Green Room restaurant, where generations of Delawareans have enjoyed the legendary brunches on Sunday, afternoon teas, and award-winning desserts. The Westin Wilmington’s River Rock Kitchen highlights local farms on a menu that leans toward small-plate sharing and fresh, organic fare. The Courtyard by Marriott Newark at the University of Delaware is a perennial winner on local “Best of Delaware” lists for their crab cakes, under the supervision of Chef Mark Chopko. The Farm A Sea Bistro and Crafthouse inside the Four Points by Sheridan Newark puts a focus on regional craft beer, with Evolution, 16 Mile, Yards and Dogfish Head all well represented.